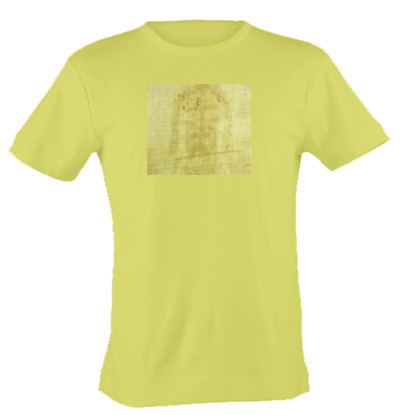 Exclusive Limited Edition Shroud of Turin T-shirt. Yes! You too can own a Precious Holy Relic. Our scientists at the International University of Nescience have successfully cloned the linen from which the Shroud was made, and the first crop is now in. Be among the first to own this piece of religious history available only from the Apathetic Agnostic Church. These quality T-shirts are made entirely from cloned Shroud linen. Extremely durable, they can be expected to last for up to 2,000 years or more, bringing joy, reverence, and enlightenment to your family for generations while still making a fashion statement. Or, you may choose to be buried in this miraculous garment. The special linen fabric is guaranteed to absorb an indelible impression of your decaying precious bodily fluids, and it then can be disinterred to be placed on display in your private memorial chapel. Order Now! - Supply is Limited.